Surging away with 5km to go Adil Annani won the 58th edition of the race writes Ken Nakamura. 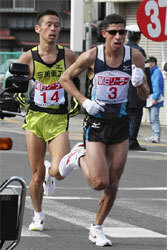 Both he and second-placed Seiji Kobayashi set personal bests with marathon debutant Keita Akiba taking third place. Peter Kiprotich, who stayed with the leaders until 36km and was still fourth at 40km, struggled home in eighth place. Defending champion Tomoya Adachi finished fifth. Twenty-three runners including three pacemakers passed 5km in 15:19. Passing 10km in 30:23 the pace later slowed as runners were exposed to a strong headwind close to the bay of Beppu. Twenty-one runners passed 15km in 45:56 and 20km in 1:01:38. Soon after the turn-around point at 25.5km, with the wind now behind the runners, the pace picked up and the leaders split into three groups. The first consisted of Kiprotich, Annani and Ryosuke Fukuyama, a debutant, along with pacemaker Jason Mbote. They were followed by Akiba and Kobayashi, while defending champion Tomoya Adachi was in the third group but was soon dropped. After passing 30km in 1:32:18, Fukuyama dropped back and at 32km Mbote finished pacemaking duties. The race now turned into a duel between Kiprotich and Annani, with Akiba and Kobayashi chasing, about 16 seconds behind. By 35km (1:45:45), Akiba and Kobayashi cut the gap to eight seconds, and a kilometre later caught the leaders. Annani then picked=2 0up the pace. Only Kobayashi was able to cover the move, and only temporarily. By 37.2Km Annani was pulling away from Kobayashi and a few hundred metres later Akiba passed Kiprotich to move up to third. While Annani's lead over Kobayashi did not grow very much by the end of the race, Annani was never in danger of losing his lead and won by 23 seconds. His victory should be sufficient for making the Moroccan marathon team for the World Championships in Berlin. Although the race was one of the qualifying races for the World Championships in Berlin the first Japanese is not guaranteed selection for the Japanese marathon team for Berlin and since Kobayashi's time is slower than that of the first two Japanese in Fukuoka Kobayashi has a little chance of qualifying. Mara Yamauchi set a new personal best in winning the 63rd edition of the race writes Ken Nakamura. She had previously done the same in the 2006 edition with a 1:09:24 timing before improving to 1:08:45 in the Sapporo Half Marathon last year. Yamauchi ran aggressively from the start, passing 5km in 15:55 then slowed slightly to record 32:04 at 10km, 48:30 at 15Km and 1:04:52 at 20km to win by 53 seconds from Second Wind AC team mate Yuki Kano. Former high school sensation Yoshiko Fujinaga, third in the 1999 World Junior Cross Country, finished third in 1:10:24, tuning up for a marathon debut this year. Reiko Tosa, competing for the first time since her agonising Olympic race where she dropped out at 25km, was fourth and will run her final marathon in Tokyo before retiring from elite competition. Naoko Takahashi, 2000 Olympic Marathon Champion who has already retired ran as a guest, completing in 1:26:18. She will also be a guest runner at upcoming Nagoya Women's Marathon. The men's race featured an anticipated showdown between two best Kenyan collegiate runners in Japan, Mekubo Mogusu and Daniel Gitau. Hoping to run under the hour Mogusu took the lead right away and only Gitau and Daniel Mwangi went with him. Mwangi soon dropped back from the furious (2:47/2:50) pace. Mogusu continued to push while Gitau ran just behind him. At 5km (14:09) they were already 51 seconds ahead of Mwangi. By 10km (28:21) the gap was 1:24 and only after passing 15km (42:48) did the pair split apart. 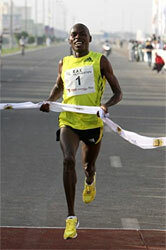 At 16.6km Mogusu started to pull away, and Gitau fell back rapidly, losing almost a minute to Mogusu by 20km (57:24). Six runners came into the stadium to battle it out for third place. Atsushi Sato, national half marathon record holder, started his kick on the back straight and finished third with 1:02:24. Five others finished within 6 seconds of him. For the third consecutive year in its short life the Ras Al Khaimah Half Marathon produced some astoundingly fast performances which leap straight to the top of the world half marathon rankings. Only unseasonably strong winds denied Patrick Makau a new world record at the distance, but he set a new mark en route at 20km. 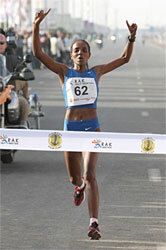 A little earlier on the course Deriba Merga had equalled Felix Limo's 7-year old world best for 15km. Merga passed 5km in 13:41 and 10km in 27:42 but the headwind worsened the effects of a slightly over-ambitious opening 5km, for which Merga paid in the final quarter of the race. He had continually surged ahead of Patrick Makau after 10km, including at the crucial 15km point, where he passed through in 41:29, a second ahead of Makau. The Kenyan repeatedly pegged him back, and into the headwind between 16-18km, Makau eased past, piling on the pressure over the last 3km to such effect that Wilson Kipsang Kiprotich, never far adrift, passed Merga as well to grab second. Storming home in 58:52, the crowds around the finish were left wondering what might have been had the wind eased. Kipsang was seven seconds down in 58:59 and a tired looking Merga, only five weeks past his debut Marathon, loped home in 59:18. He is overdue for a rest, but plans to run Boston in just eight weeks' time. The women's race looked like following the tactical pattern of the last two years with a slow opening 5km of 16:12 holding a pack of fifteen athletes together. At 10km (32:14) the pack was down to ten, but a quartet comprising Dire Tune, Asefelech Mergia, Abebu Gelan and last year's world leader Philes Ongori flew through the next 5km in 15:39 (15km: 47:53). Dire Tune ran the next 5km in 15:49 to go clear and held on to win in a new personal best by almost four minutes. Mergia took second a full 30 seconds behind, although she too was 29 seconds faster than ever before, while Ongori in third also broached new territory with 1:07:50, another personal best, this time by 7 seconds. Gelan ran the fastest time ever by a junior. Five men broke the one hour barrier, and 10 women broke 70 minutes. In the 25th anniversary edition both men's and women's records were beaten, and in total almost 4000 runners took part - up 25% since last year. 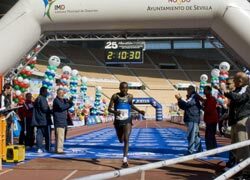 Haylu Abebe's 2:10:30 surpassed the performance of Jose Ramon Rey (ESP) from 2001 by 19 seconds, while Marisa Barrios's time broke the 13-year old mark of 2:28:59 which stood to Maria Luisa Munoz by nearly three minutes.